Purple power! Sugilite can help you to access the higher realms by opening your third eye and transpersonal chakras to the higher consciousness carried on the Purple Ray. Its darker and black inclusions ground its presence into your being. 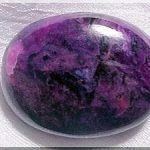 This is why Sugilite is a stone to use for accessing and remembering your dreams and for expanding your consciousness. Sugilite is another wonderful crystal to assist your psychic intelligence and connection. Placed at the third eye during meditation it can help with your inner sight and perception and to open you to the higher realms. Small tumbled stones or cabochons can easily be slipped into a pocket for ease of regular use and to bring you back to the truth of who you are. Like amethyst, it ushers in a state of peace and helps you to “let go and let god”.